The following interactive key is based on the key in The Genera of Araceae ( Mayo, Bogner and Boyce, 1997 ). │ ├2B. Leaves with distinct petiolePetiole: Leaf stem. and expanded blade, primary venationVenation: The arrangement of veins in the leaf. never strictly parallelParallel: Parallel Venation. │ │ │ │ │ │ ├9B. Palaeotropical plants; seeds without endospermEndosperm: A tissue produced inside the seeds of most of the flowering plants following fertilization. It surrounds the embryo and provides nutrition in the form of starch, though it can also contain oils and protein. ; pollen monosulcateSulcate: Furrowed; grooved. or inaperturateInaperturate: Without an opening. │ │ │ │ │ ├8B. Stem typically subterranean, tuberous or rhizomatous, sometimes aerial and creeping or scrambling but then aculeateAculeate: Sharply pointed; prickly. ; plant frequently a helophyteHelophyte: A bog plant; especially a perennial marsh plant having its overwintering buds under water. │ │ │ │ │ │ │ ├14B. OvaryOvary: The part of the pistil which holds the ovule(s) and is located above or below or at the point of connection with the base of the petals and sepals. 1-locularLocular: A locule is a small cavity or compartment within an ovary. ; ovuleOvule: The structure that gives rise to and contains the female reproductive cells 1, placentaPlacenta: The part of the ovary where the funiculus attaches is referred to as the placenta. apicalApical: Of, relating to, or denoting an apex. or basalBasal: Forming or belonging to a bottom layer or base. │ │ │ │ │ │ │ ┌16A. Leaf deeply sagittateSagittate: , anteriorAnterior: division not pinnatifidPinnatifid: or pinnatisectPinnatisect: Having lobes with incisions that extend almost, or up to midrib. │ │ │ │ │ │ │ │ ┌17A. OvaryOvary: The part of the pistil which holds the ovule(s) and is located above or below or at the point of connection with the base of the petals and sepals. many- to 2-ovulateOvulate: The structure that gives rise to and contains the female reproductive cells , rarely 1-ovulateOvulate: The structure that gives rise to and contains the female reproductive cells ; seeds with endospermEndosperm: A tissue produced inside the seeds of most of the flowering plants following fertilization. It surrounds the embryo and provides nutrition in the form of starch, though it can also contain oils and protein. │ │ │ │ │ │ │ │ ├17B. OvaryOvary: The part of the pistil which holds the ovule(s) and is located above or below or at the point of connection with the base of the petals and sepals. 1-ovulateOvulate: The structure that gives rise to and contains the female reproductive cells , rarely 2-ovulateOvulate: The structure that gives rise to and contains the female reproductive cells ; seeds without endospermEndosperm: A tissue produced inside the seeds of most of the flowering plants following fertilization. It surrounds the embryo and provides nutrition in the form of starch, though it can also contain oils and protein. or rarely with a little endospermEndosperm: A tissue produced inside the seeds of most of the flowering plants following fertilization. It surrounds the embryo and provides nutrition in the form of starch, though it can also contain oils and protein. │ │ │ │ │ │ │ │ │ ┌22A. Leaf blade dracontioidDracontioid: , anteriorAnterior: division bipinnatifidPinnatifid: or yet more highly divided; stem a depressed-globose tuber; spatheSpathe: A large sheathing bract enclosing the flower cluster. fornicateFornicate: Arched or bending over. │ │ │ │ │ ├29B. PetiolePetiole: Leaf stem. well-developed with annular insertion and usually conspicuous sheath; trichosclereidTrichosclereid: A hard, needle-like branched cell. s present in tissues, or if absent (or nearly so) then leaf with conspicuously reticulateReticulate: Reticulate Venation. higher order venationVenation: The arrangement of veins in the leaf. and often perforateForate: With aperatures or openings. d or lobed (Amydrium); primary lateral veinVein: Venation types: A. midrib; B. primary lateral veins; C. interprimaray veins; D. secondary veins; E. collective veins; F. tertiary veins; G. basal ribs; H. basal veins. s usually not forming distinct submarginal veinVein: Venation types: A. midrib; B. primary lateral veins; C. interprimaray veins; D. secondary veins; E. collective veins; F. tertiary veins; G. basal ribs; H. basal veins. │ │ │ │ │ │ ├30B. TrichosclereidTrichosclereid: A hard, needle-like branched cell. s abundant; higher order leaf venationVenation: The arrangement of veins in the leaf. parallelParallel: Parallel Venation. to primary lateral veinVein: Venation types: A. midrib; B. primary lateral veins; C. interprimaray veins; D. secondary veins; E. collective veins; F. tertiary veins; G. basal ribs; H. basal veins. s, or only finest venationVenation: The arrangement of veins in the leaf. reticulateReticulate: Reticulate Venation. │ │ │ │ │ │ │ ┌31A. OvaryOvary: The part of the pistil which holds the ovule(s) and is located above or below or at the point of connection with the base of the petals and sepals. 1-locularLocular: A locule is a small cavity or compartment within an ovary. or incompletely 2-locularLocular: A locule is a small cavity or compartment within an ovary. │ │ │ │ │ │ │ │ ├32B. OvuleOvule: The structure that gives rise to and contains the female reproductive cells s amphitropous to anatropous, solitary, basalBasal: Forming or belonging to a bottom layer or base. │ │ │ │ │ │ │ ├31B. OvaryOvary: The part of the pistil which holds the ovule(s) and is located above or below or at the point of connection with the base of the petals and sepals. 2-5 locularLocular: A locule is a small cavity or compartment within an ovary. │ │ │ │ │ ┌38A. StamenStamen: The pollen-producing reproductive organ of a flower. s of each male flower free or only the filaments connateConnate: United so as to form a single part. │ │ │ │ │ │ │ ┌40A. 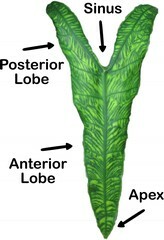 Higher order leaf venationVenation: The arrangement of veins in the leaf. parallel-pinnateParallel-pinnate: Parallel-Pinnate Venation. │ │ │ │ │ │ │ │ │ ┌47A. PlacentaPlacenta: The part of the ovary where the funiculus attaches is referred to as the placenta. s parietal; thecaeThecae: One of the lobes of an anther in which pollen is produced. truncate. │ │ │ │ │ │ │ │ │ │ ├49B. ThecaeThecae: One of the lobes of an anther in which pollen is produced. horned; placentaPlacenta: The part of the ovary where the funiculus attaches is referred to as the placenta. basalBasal: Forming or belonging to a bottom layer or base. or basalBasal: Forming or belonging to a bottom layer or base. and apicalApical: Of, relating to, or denoting an apex. │ │ │ │ │ │ │ │ │ │ │ ┌50A. StigmaStigma: The receptive tip of a carpel, or of several fused carpels, in the gynoecium of a flower. smaller than ovaryOvary: The part of the pistil which holds the ovule(s) and is located above or below or at the point of connection with the base of the petals and sepals. ; upper part of spadixSpadix: A spike of minute flowers closely arranged around a fleshy axis and typically enclosed in a spathe. sterile with a distinct appendixAppendix: Sterile appendage at the end of a spadix. of hornless sterile flowers; spatheSpathe: A large sheathing bract enclosing the flower cluster. constricted or not; stamenStamen: The pollen-producing reproductive organ of a flower. s never excavated apicalApical: Of, relating to, or denoting an apex. ly. │ │ │ │ │ │ │ ├40B. 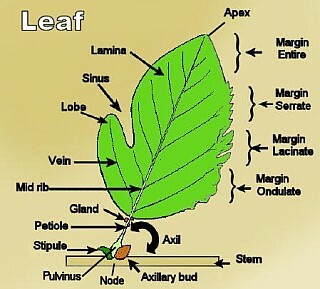 Higher order leaf venationVenation: The arrangement of veins in the leaf. reticulateReticulate: Reticulate Venation. │ │ │ │ │ │ │ │ │ │ ├58B. Terrestrial, hemiepiphyticEpiphytic: A plant that grows harmlessly upon another plant and derives its moisture and nutrients from the air, rain, and sometimes from debris accumulating around it. or epiphyticEpiphytic: A plant that grows harmlessly upon another plant and derives its moisture and nutrients from the air, rain, and sometimes from debris accumulating around it. plants, leaf blade variously shaped; tropical Africa. │ │ │ │ │ │ │ │ │ ├57B. SpadixSpadix: A spike of minute flowers closely arranged around a fleshy axis and typically enclosed in a spathe. with � smooth terminal appendixAppendix: Sterile appendage at the end of a spadix. │ │ │ │ │ │ │ │ │ │ │ │ │ ┌68A. PlacentaPlacenta: The part of the ovary where the funiculus attaches is referred to as the placenta. s basalBasal: Forming or belonging to a bottom layer or base. and apicalApical: Of, relating to, or denoting an apex. │ │ │ │ │ │ │ │ │ │ │ │ │ ├68B. PlacentaPlacenta: The part of the ovary where the funiculus attaches is referred to as the placenta. basalBasal: Forming or belonging to a bottom layer or base. │ │ │ │ │ │ │ │ │ │ │ │ ┌75A. OvaryOvary: The part of the pistil which holds the ovule(s) and is located above or below or at the point of connection with the base of the petals and sepals. several-ovulateOvulate: The structure that gives rise to and contains the female reproductive cells ; female zone of spadixSpadix: A spike of minute flowers closely arranged around a fleshy axis and typically enclosed in a spathe. free from spatheSpathe: A large sheathing bract enclosing the flower cluster. ; spatheSpathe: A large sheathing bract enclosing the flower cluster. without a transverse septumSeptum: A partition that separates the locules of a fruit, anther, or sporangium. separating male and female zones. │ │ │ │ │ │ │ │ │ ┌81A. OvuleOvule: The structure that gives rise to and contains the female reproductive cells s anatropous; primary lateral veinVein: Venation types: A. midrib; B. primary lateral veins; C. interprimaray veins; D. secondary veins; E. collective veins; F. tertiary veins; G. basal ribs; H. basal veins. s of leaf forming a single marginal veinVein: Venation types: A. midrib; B. primary lateral veins; C. interprimaray veins; D. secondary veins; E. collective veins; F. tertiary veins; G. basal ribs; H. basal veins. , no submarginal collective veinVein: Venation types: A. midrib; B. primary lateral veins; C. interprimaray veins; D. secondary veins; E. collective veins; F. tertiary veins; G. basal ribs; H. basal veins. present; plant from tropical America or continental tropical Africa. │ │ │ │ │ │ │ │ │ │ ├82B. Female zone of spadixSpadix: A spike of minute flowers closely arranged around a fleshy axis and typically enclosed in a spathe. entirely adnateAdnate: Joined by having grown together. to spatheSpathe: A large sheathing bract enclosing the flower cluster. ; plant from tropical America. │ │ │ │ │ │ │ │ │ ├81B. OvuleOvule: The structure that gives rise to and contains the female reproductive cells s orthotropous to hemi-orthotropous; primary lateral veinVein: Venation types: A. midrib; B. primary lateral veins; C. interprimaray veins; D. secondary veins; E. collective veins; F. tertiary veins; G. basal ribs; H. basal veins. s of leaf forming submarginal collective veinVein: Venation types: A. midrib; B. primary lateral veins; C. interprimaray veins; D. secondary veins; E. collective veins; F. tertiary veins; G. basal ribs; H. basal veins. and 1-2 marginal veinVein: Venation types: A. midrib; B. primary lateral veins; C. interprimaray veins; D. secondary veins; E. collective veins; F. tertiary veins; G. basal ribs; H. basal veins. s; plants from temperate eastern North America or Madagascar. │ │ │ │ │ │ │ │ │ │ ├86B. StamenStamen: The pollen-producing reproductive organ of a flower. s completely connateConnate: United so as to form a single part. into truncate synandriaSynandria: Sets of stamens of which the anthers have been fused. or synandriaSynandria: Sets of stamens of which the anthers have been fused. reduced to one stamenStamen: The pollen-producing reproductive organ of a flower. │ │ │ │ │ │ │ │ │ │ ┌88A. SpadixSpadix: A spike of minute flowers closely arranged around a fleshy axis and typically enclosed in a spathe. free or only female zone adnateAdnate: Joined by having grown together. to spatheSpathe: A large sheathing bract enclosing the flower cluster. │ │ │ │ │ │ │ │ │ │ │ │ ├90B. OvuleOvule: The structure that gives rise to and contains the female reproductive cells s 1 per loculeLocule: A small cavity or compartment within an ovary. ; leaf blade entire, pinnatifidPinnatifid: to subdracontioidDracontioid: ; spadixSpadix: A spike of minute flowers closely arranged around a fleshy axis and typically enclosed in a spathe. fertile to apexApex: End forming a point. │ │ │ │ │ │ ├78B. LaticiferLaticifer: A laticifer is a type of elongated secretory cell found in the leaves and/or stems of plants that produce latex and rubber as secondary metabolites. s anastomosingAnastomosing: Connecting with one another, particularly applied to veins.